Nine years ago, when I first began to practice yoga, I did not consider yoga as a tool for environmental awareness. 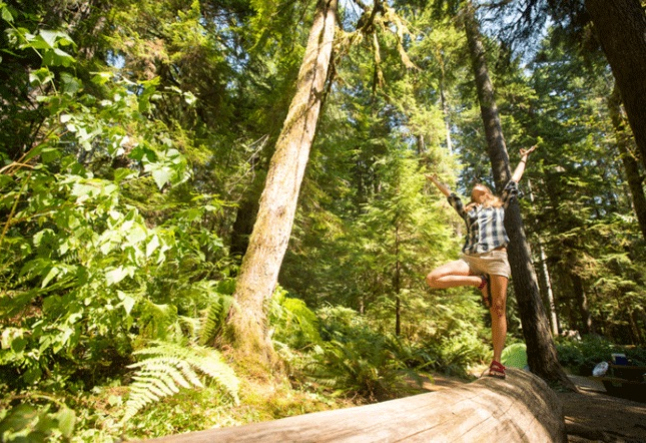 In fact, I probably would have thought that the only connection yoga had to the natural environment was through vrksasana (tree pose). Luckily, my understanding of yoga has since changed and I am able to see the benefits of practice beyond my mat. Yoga provides an eight-limbed path that practitioners can utilize both on and off the mat. Despite its ancient history and philosophy, modern yoga is primarily marketed as a tool to improve your body. This individual, physical focus overlooks the potential for yoga to encourage collective action that benefits the community and environment. Don’t get me wrong--yoga is a great tool for self-improvement and is beneficial for the body and the mind. But how does yoga function off of the proverbial mat? People who feel empowered are more likely to adjust their behavior to help their community and environment. In this way, yoga can help empower people to step up and make changes on both an individual and community level. Yoga provides everyone with a toolkit to operate in the world. Ultimately, these tools set the stage for self-improvement. This stage may also function as a launching pad that allows for an improved person to conduct themselves in ways that benefit others and the environment. We are living in a time when climate change caused by our behaviors is a threat to every being on the planet. The task to do something can feel daunting--but yoga can help you take steps toward making a difference. The size of the difference doesn’t matter--it is the action, no matter how big or how small, that does. The first path mentioned in the Yoga Sutras are the yamas (standards of how we should conduct ourselves with others and our environment). While each of the yamas can be personalized for specific situations, they are connected to how we interact with our natural environment. The environment, our communities and each of us as individuals are inextricably interconnected. Ahimsa (non-harming): Does your behavior harm the environment? Scientific consensus provides overwhelming evidence that our behavior has a detrimental impact on Earth (i.e. climate change). This, of course, has a negative impact on people, animals, and flora around the world. Most of the harm is rooted in our choices as consumers, including a dependence on fossil fuels and using products that are toxic for the environment. Focus on shopping locally, reducing your dependence on gas, and repurposing and re-using instead of buying new products. Satya (truth): Speaking the truth is vital when it comes to protecting our environment. A plethora of scientific knowledge exists about how we can help improve our environment, but some ignore it. Speak to others about these issues and do not be fearful of stating the truth. Asteya (non-stealing): Are you taking things from others? An example of this may be the consumption of energy. Reduce your energy consumption by washing clothes on cold water, air drying laundry and watching your electricity use in the house. Brahmacharya (not wasting energy): Being aware of our natural environment and plight of climate change can be a huge energy drain. Be mindful of what you can take on. Small steps, whether it be recycling more, planting a garden, or speaking to a friend about making more environmentally friendly consumer choices all require you to take care of yourself. And if you take care of yourself, you'll be able to do a better job caring for others and the environment. Aparigraha (non-greedy): Do you have everything you need? We are avid consumers, and often buy things we simply do not need. Try to curb the urge to buy things that aren't essential, and share with others. Volunteering with a local conservation effort is a great way to get involved and share your actions with your local community. The yamas are just one example of how you can get started being more engaged and aware with our natural environment. Does yoga directly affect climate change? No. But yoga does empower even just one person to take action and make a difference in their community and environment. Our behavior has an effect on the world, and that is a powerful thing. Let’s adjust our behaviors in a way that promotes celebrating and protecting our environment, our communities, and ourselves.